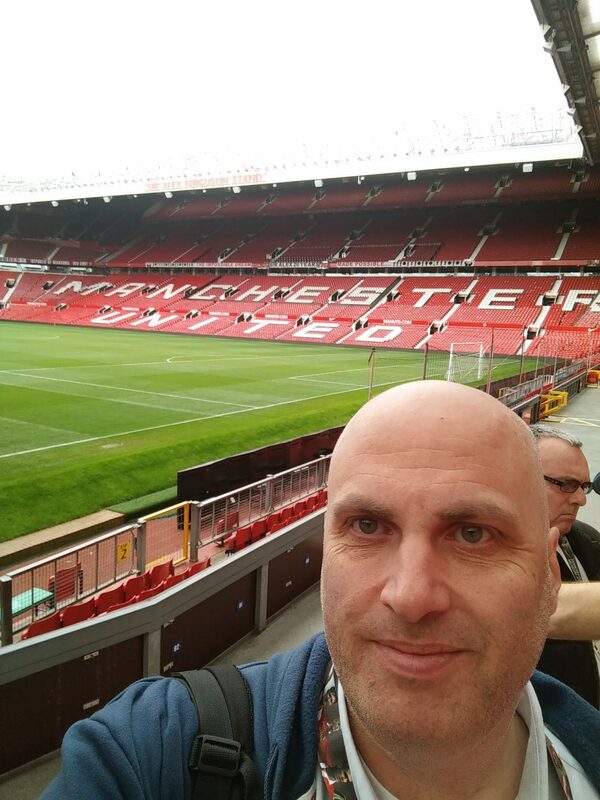 On Saturday we took my 8-year-old nephew to the Old Trafford Stadium Tour in Manchester. He’s a big Manchester United fan, and had been eagerly looking forward to the visit for weeks. We set off early for the airport, to catch our flight from Dublin to Manchester. We then took the tram from the airport to Trafford Bar, which is 18 stops and a 40 minute ride. We changed platforms and got onto another tram, and took 1 stop to Old Trafford. The tram station itself is beside the cricket ground (also called Old Trafford), and so there’s a 1km walk to the football ground. We arrived at the ground at about 1pm, and headed for some lunch in the Red Cafe, which is part of the visitors attractions in the ground. The food is pretty standard fair – burgers, fish and chips, and so forth – but it’s pretty good quality, and reasonably priced around the £10-12 range. After lunch we headed for the museum, which is included in the price of the tour. The museum contains thousands of items of memorabilia stretching over the lifetime of the club. There’s hundreds of different trophies, football shirts, programmes, and other items – and an interesting section about the Munich disaster, when a plane carrying the team in 1958 crashed and killed 23 people. At our pre-booked tour time, we gathered up at the meeting point, and our two guides took us into the stadium. It was pretty cool to see all the different parts, including the dressing rooms, VIP room, press theatre, director’s box, and the player’s tunnel. My nephew was especially excited as he was picked to lead out the ‘team’ from the tunnel to the pitch-side. I was interested to note the marked difference between the home and away dressing rooms. The home team definitely have an advantage, in terms of facilities and atmosphere, to help them in their preparations before the game – but I’m sure that happens in all sports stadiums. After the tour, which takes around an hour, we then had just enough time to visit the Manchester United Megastore to pick up a few souvenirs, before it was time to head back to the airport for our flight home. It had been a long day by the time we got home, but we enjoyed it – especially my nephew, who will no doubt be talking about it to anyone who’ll listen for weeks to come!